Dr. Della Ratta completed a Doctor of Philosophy degree at Adelphi University, a Master of Science degree at Stony Brook University, and a Bachelor of Science in Nursing degree at the College of New Rochelle. 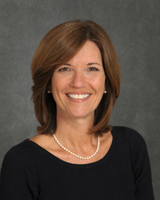 With 25 years of experience teaching in undergraduate basic, accelerated, and RN to BS programs, Dr. Della Ratta’s most recent efforts focus on the implementation of active learning strategies such as on-site and distance team-based learning, and simulation experiences. She has participated in the design and piloting of an interprofessional simulation experience for senior nursing and medical students. Dr. Della Ratta authored several professional publications and has presented nationally on these teaching innovations. Her research interests include new graduate nurses’ transition to practice and preceptor development. Since 2007, Dr. Della Ratta has served as nurse resident facilitator at Stony Brook Medicine, Vizient/AACN Nurse Residency Program. Dr. Della Ratta mentors nurse residents, faculty, and students. In 2013 she worked with students to establish the Stony Brook chapter of the National Student Nurses’ Association, (SBSNA). As faculty advisor to this chapter, she mentors students preparing for initial licensure as registered nurses to the standards, ethics, and skills needed as responsible and accountable leaders and members of the profession. Dr. Della Ratta has been honored with several regional awards for her contributions to Stony Brook University, including the 2016 Dean’s Award for Faculty Excellence and Stony Brook University 2016 Student Life Award for Outstanding Advisor to SBSNA. She is a sustaining member of NSNA and a member of Sigma Theta Tau International and the American Association of Critical Care Nurses. Buhse, M. & Della Ratta, C. (2017). Enhancing interprofessional collaboration with team-based learning. Nurse Educator (in press). Della Ratta, C. (2016) Challenging graduate nurses' transition: Care of the deteriorating patient. Journal of Clinical Nursing. 25, 3036–3048, doi: 10.1111/jocn.13358. Gambino, K.M, Della Ratta, C.B., Janotha, B.L., Coletti, V.A. & Cavaliere, T.A. (2015). Team-based learning in online nursing education:  An innovation in curriculum development. In Caputi, L. (Ed. ), Innovations in nursing education:  Building the future of nursing Volume 3 (135-138). Washington, DC:  National League for Nursing. Buhse, M., Della Ratta, C., Galiczewski, J., & Eckardt, P. (2015). Caregivers of older persons with multiple sclerosis: Determinants of health-related quality of life. Journal of Neuroscience Nursing, 47(2), E2-E12. doi: 10.1097/JNN.0000000000000117.